Now not all the above negatively impact your testosterone levels or are endocrine disruptors. Moving forward with the article we’re going to focus on the chemicals that lower testosterone & can be considered endocrine disruptors. As a high level overview, endocrine disruptors are chemicals that can interfere with your endocrine/ hormone systems. These disruptions can lead to incorrect hormone production & hormonal imbalance. This includes lowered testosterone but hormonal imbalances can potentially cause even more serious issues, like development of cancerous tumors, birth defects & other developmental disorders. As you can see the above is fairly worrying, endocrine disruptors potentially causing hormonal imbalances and lowering testosterone production is just the “tip of the iceberg”. So now you hopefully have more of an understanding of what endocrine disruptors are and the dangers they pose above being chemicals that lower testosterone production. With that being said, lets take a look at the chemicals that pose a risk to testosterone and your endocrine system in a bit more detail. Aluminum is the ingredient in antiperspirants responsible for clogging pores and is what actually prevents sweating. In tests Aluminum exposure has been shown to interfere with testosterone and estrogen levels. When your body can’t process estrogen and testosterone properly, there’s a higher risk of a number of illnesses breast cancer, prostate cancer and Alzheimer’s disease included amongst them. This chemical is used in wide range of skin and cosmetics products, you will see it is a common appearance in my Chemicals That Lower Testosterone Articles – It is used as a preservative in these products, the issue is two fold it mimics estrogen in your body, lowering your ratio of testosterone to estrogen. Parabens are also an endocrine disruptor, which as we covered above and disrupts hormonal balances and can cause wider health issues. Research conducted by the US EPA (Environmental Protection Agency) has linked methyl parabens to developmental, metabolic, hormonal, & neurological disorders. So parabens don’t just lower effect your testosteorne and your endocrine system but potentially are a threat to multiple areas of health! The FDA in America has classified this chemical as a pesticide, despite that it is a common ingredient in deodorants & antiperspirants. Triclosan has been linked to potential antibiotic resistance & is also an endocrine disruptor, which is what makes it a threat to testosterone production. An endocrine disruptor in animal studies, may trigger asthma, may cause allergic reaction including eye irritation, immune system toxicant. Possible carcinogen, forms carcinogenic nitrosamines when mixed with nitrosating agents. Pronounced as thal-ates, these are a chemical that disrupt your endocrine function and negatively impact the male reproductive system. This includes the destruction of testicular cells, decreasing sperm count and causing thyroid irregularities, with the latter two being the main reason they are such a threat to testosterone production. This is due to the testes & thyroid being responsible for regulation and production of testosterone. The major issue with phthalates is that you don’t see them directly listed on products ingredients! The main thing you need to look out for is synthetic fragrance. “Fragrance”/ “pafum” is possibly the most ambiguously listed ingredient in existence. The issue is from a legal standpoint that it’s considered “proprietary,” and due to this manufacturers don’t have to disclose the what their fragrance is made from and this is how chemicals that lower testosterone like phthalates can be sneaked in. As we’ve mentioned above, fragrance formulations are usually “trade secret” information and as a result don’t have to be revealed. There are however some common fragrance ingredients used, one is phthalates which we’ve covered above. Others are synthetic musk, such as galaxolide and tonalide, these have been linked to endocrine disruption and are likely chemicals that lower testosterone. The sad fact is that the majority of anti perspiring brands and products contain these chemicals. I certainly advise to check the ingredients labels and looking up online what chemicals products contain. Pretty much all brands that don’t contain these types of chemicals, advertise themselves as such and are big at promoting on that front. Look for organic brands or brands that promote themselves as being free of toxic chemicals. As mentioned above, organisations that promote themselves as being organic and free of toxic chemicals are going to be your main products to look for. There are a couple of brands that I personally use and can recommend which are Bull Dog Skin Care For Men & Man Cave products. Both are free of toxic chemicals and the chemicals mentioned above and actually provide a broad range of products on that basis. I’ll be putting together an article soon, reviewing my recommended antiperspirants free of chemicals that lower testosterone, for now you can check out their antiperspirants for yourself below. I hope you have found this article on chemicals that lower testosterone in antiperspirants useful. You should now have an understanding of what the main dangerous chemicals are and the threat they pose to your health over and above potentially lowering testosterone. 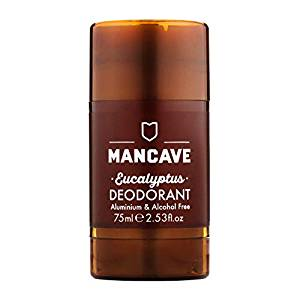 As I mentioned above, I will be creating an article reviewing my top recommended antiperspirants that don’t contain chemicals that lower testosterone so keep an eye out for that or check out the links above to see two of my recommendations. If you have any questions in regard to this article, things that can lower T or testosterone production as a whole, just drop me a comment below and I’ll get back to you. i always though aluminium in deodorants were bad. didn’t realize chemicals in antiperspirant also had an impact on testosterone. Yeah sadly they do, most brands contain chemicals that lower testosterone and are endocrine disruptors. Basically these chemicals can cause a lot of health damage. I will be having my husband to read this article. I did not know some many different things could cause low testosterone, I am pretty sure my husband did not either. My husband is a cologne wearer so we are going to have check out those ingredients on the back or the box for now one. The sneaky way the manufacturer slap organic on something and come to find it out is worse than the regular stuff. All of your information is informative and very insightful. I’m glad you found it useful! Yeah it’s scary how many products contain chemicals that can lower testosterone and cause endocrine disruption. I do wear like to wear cologne but I like to make up for it, by making sure the other products I use has as little at the toxic chemicals as possible. Yeah please do get your husband to have a read, I think he’ll find it useful! Great article and this is what I call “Chemical Castration”. I have the tendency to avoid all harmful non-natural products that will have an effect on my body (and not just testosterone levels). One of the big dangers is Xenoestrogens. Boosting our T-levels involves some defensive moves before we go offensive and outright boost it!. Spot on, I also believe it is a form of “chemical war fare” and you’re correct, it isn’t just a case of these chemicals lowering testosterone but they cause all sorts of health issues! I think chemicals in our everyday environment and food chain are likely the main cause for the global epidemic of fertility problems and low testosterone in young men. That and the modern day lifestyle of too little activity and over consumption of calories. I’m an environmental engineer by profession and have followed the studies on micro plastics in our environment for the past decade. The stuff is literally everywhere. It’s in the sand on your local beach, it’s inside the fish and meat you eat, it’s inside you. It’s even in the air we breath in cities and it’s even found it’s way deep in to the Amazon forests. There is nothing you can really do about it either because the problem is so wide spread. We know that chemical softeners of plastic like bisphenol-A and phtalates are potent endocrine disruptors and xenoestrogens that wreak havoc on our endocrine system and especially on male androgen system. Just like these cosmetic chemicals do. You’re correct, the issue is that these chemicals are everywhere and we are exposed at all turns. That is why I advise on ways to reduce your exposure where possible. Being in your line of work, you’ll know that endocrine disruptors reduce testosterone production and cause multiple other health issues. Thanks for sharing Jukka, appreciated as always! Wow thanks for sharing. I use an anti- perspirant daily and I never realised there were so many harmful chemicals in them. I know I tend to pick ones that smell good, and they are normally brand names you think you can trust. They are marketed well. I just wondered if roll on deoderants were as harmful as anti-perspirants. I am definitely interested in reading your article promoting products which are free of chemicals. I have bookmarked for future. Yeah check out my other articles on alternatives to these products that contain toxic chemicals and keep an eye out for my future ones.